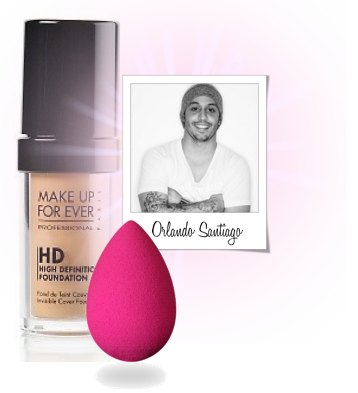 "i love applying make up for ever's HD foundation with the beautyblender. it leaves the skin flawless"
i first used the beautyblender last fall backstage during fashion week at the tory burch show. before the easter holiday my 5 year old son asked me if he could hide one of my beautyblenders for an "easter egg hunt" around the house ...so jokingly i let him hide it but he forgot where he put it, and so we never found it again. i suspect he threw it out the window. "My good friend @orlandosantiago at @TheMakeupShow with full day makeup 101 workshop. www.themakeupshow.com for details"